Je suis belle et ça ne demande aucun effort. 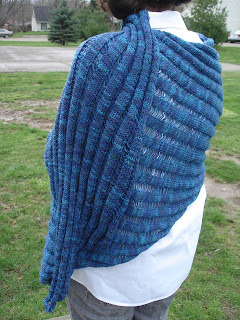 A lot of people have said a lot of things about the Clapotis. And sometimes people can say that they do not like something while simultaneously implying that everyone who does is a simpleton with poor taste. The Clapotis is popular, and inevitably with things that are popular, a percentage of people will sniffily say that they don't get what all the fuss is about; they don't knit things just because those things are popular. Really, does anybody choose to knit something they don't genuinely like just because it's popular? I don't know anybody who does that. (Um, I mean, I do spend a lot of time alone, so a survey of my knitting buddies does not a good sample make.) People might take a second look at something because it's popular, wondering what attraction they missed the first time around, but I can't even imagine someone picking out yarn and casting on something, saying "Well, gosh, I hate wool-silk blends and wrappy scarf things, but it's popular, so..." It seems just as silly to refuse to knit something you genuinely like just because lots of other people have. I really like it. 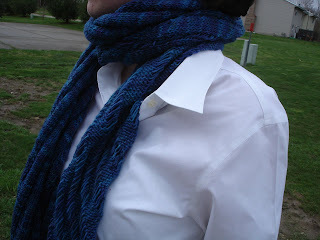 News flash: shawls are warm in a different way that scarves are warm! And once again I need to learn from experience something that women have known for hundreds of years. When I first saw this pattern, which must have been pretty early in my knitting career, I thought it looked nice but had no desire for a massive worsted-weight wool scarffy-wrap thing. This feeling persisted until it started to get chilly in the fall, and on my way out the door one evening I found myself wishing I had a Clapotis to grab. That was all the incentive I needed for this puppy. Midway through it, I wanted nothing but to be done with it, and now all I want is to cast on another. Luckily I don't have 3-4 skeins of any yarn that would be remotely appropriate, so I can turn to other things. Modifications: None whatsoever. Oh, except I made them shorter. Turns out when you make these 15 3/4" long, you can get a full pair out of one skein of the Quatro with about a foot of yarn left over. 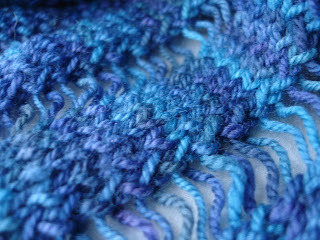 That was an exciting finish, made slightly less exciting by the fact that I'd gotten two skeins of it. I'd been hoping to make the Mrs. Beetons out of my leftovers, but it seems silly to break into a skein for them, so that's on hold for now. 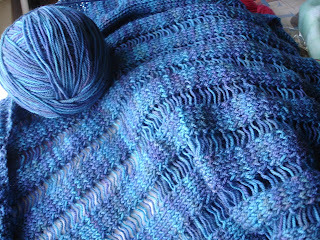 This is the same Smooshy that my Endpaper Mitts are made out of, and it is very, very ocean-y, blue with hints of purple and green. And, finally: the Sundara poll. I had actually been pulling for the scarf, but the socks took the early lead. 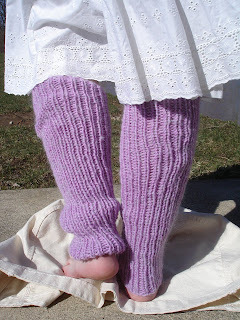 So, I figured, hey, the internets knows what it's talking about -- socks it is. There's a decent chance that that particular color should not even be coming within five feet of my face anyway, because warm yellows tend to make me look like microwaved death. (I'm a Fall. Or Summer. Or whichever one can basically only wear dark blue.) But now, scarf is even with socks at three votes. Hmm. Maybe the microwaved death question will be the tiebreaker.